For some reason in January I noticed there were a lot of searches on the blog for snack ideas and school lunch ideas. 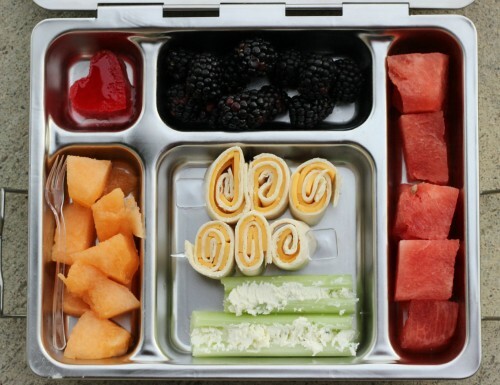 Usually I see those searches at the beginning of the school year but since people seemed to be looking for inspiration, I decided to put together a post with all sorts of lunch and snack ideas for the kiddos. I do put some effort into lunchboxes. 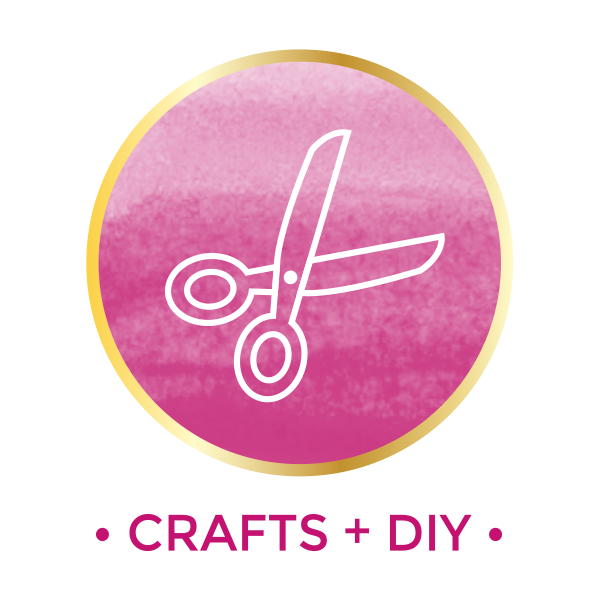 I usually spend 15-20 minutes per night making them for my girls and then I make something very similar for my husband and myself. I want my girls eating good food so they have energy to get through the day and so they can concentrate and focus on schoolwork in the afternoon. 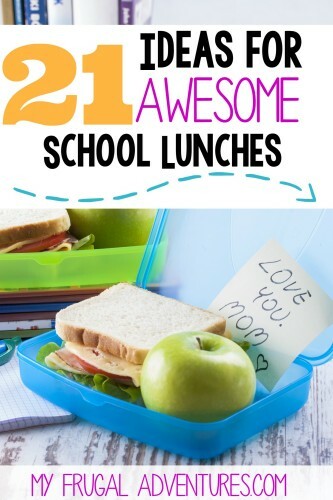 It is also important that they are excited to eat lunch- those of you with little ones know what a big deal lunch and snacks can be for children. Mine get extremely excited to open up lunchboxes and see what waits inside. 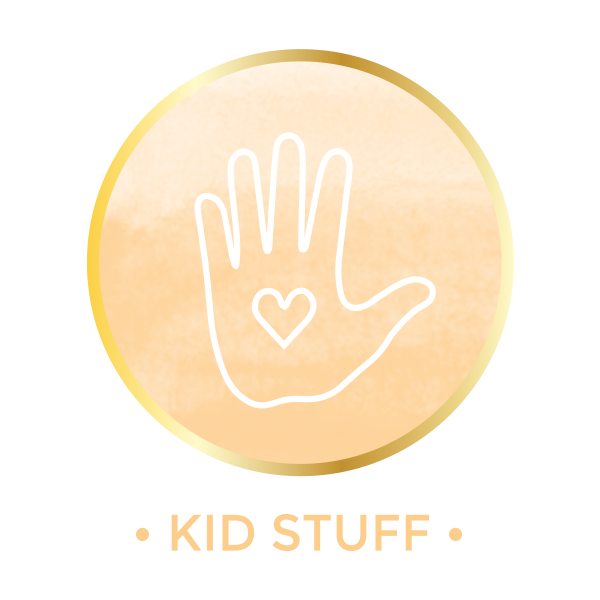 I usually pick my battles with food for the kiddos- dinnertime is when we arm wrestle over what they will eat- for lunch I prefer to stick to things I know they like. That eliminates waste and also they haven’t reached the stage yet where they just throw things away and pretend to have eaten it 🙂 I can see exactly what they eat and for the most part these lunchboxes come home completely empty. Sadly my girls don’t like so many things– lunch meat (with the exception of salami or roast beef), avocados, most vegetables… the list goes on and on. 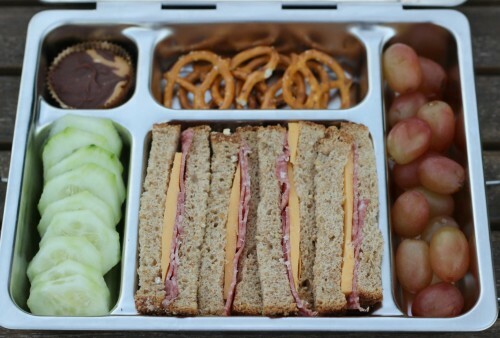 Oh and this school year the kids have been really excited for lunch– they actually open it in the car on the way to school and it is so fun to hear them chatter. “Oh look Addy we got watermelon today!” or whatever and I can hear them already sneaking a few bites of this or that. So I do feel the small amount of time at night really pays off. Some things I take into consideration- I don’t pack things that will potentially get soggy like quesadillas or things that really are better hot like English Muffin pizzas. I also try not to pack things that will take too long to eat. The kids like to hurry through lunch to get to recess time so nothing fussy or they miss recess. Anyhoo– these aren’t perfect lunches (we eat cookies and crackers and chips in moderation) but they are examples of things I have packed over the last month or so. 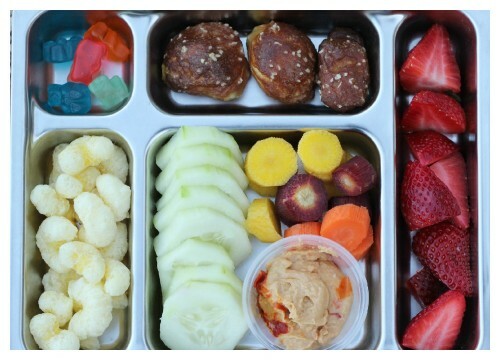 I do wish I could have lunchboxes filled with broccoli and avocado and beets and tell you my little ones ate every bite- but sadly I tend to stick to cucumbers and carrots as I know they will for sure eat those. One of my kids is allowed peanut butter and one is allowed peanut butter but she has to sit in a specific section of the cafeteria so I try not to use it in her lunchbox. 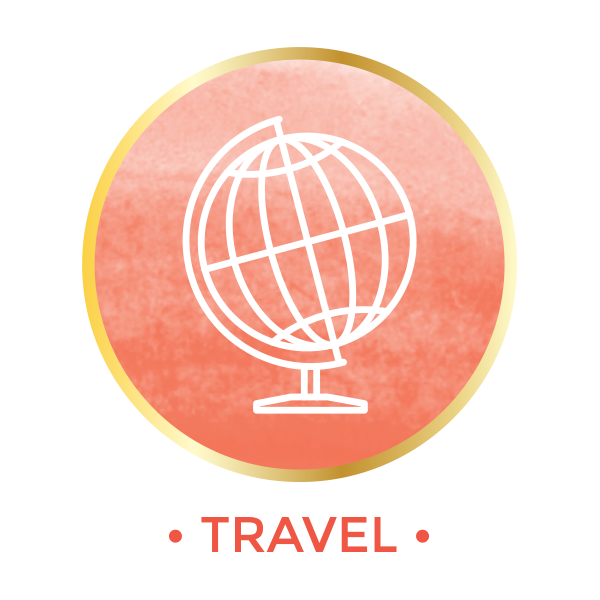 Otherwise, we don’t have any food allergies or other dietary concerns. 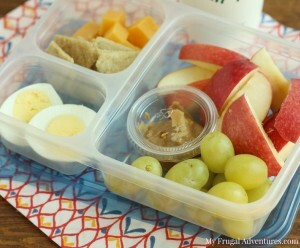 My girls love those little Bento Boxes from Starbucks so this was a copycat of one of the bento boxes- sliced apples and peanut butter, grapes, hard boiled egg, crackers and cheese cubes. 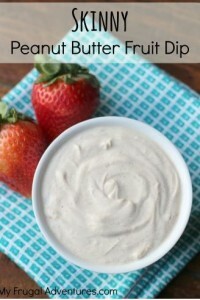 For the no-peanut butter kid, I use the almond butter recipe here instead. This particular box was actually not for lunch but was what I packed for an airplane trip. The girls ate every bite. 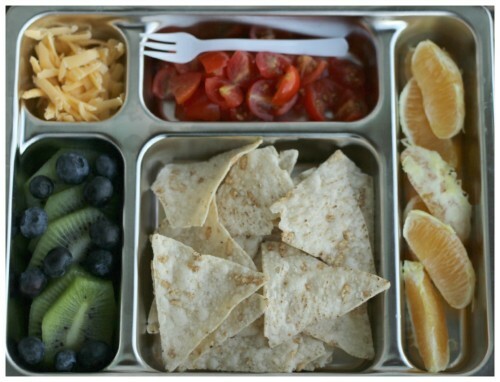 “Nachos Lunch” with brown rice chips, shredded cheddar, tomatoes, oranges, kiwi and blueberries. My big girl prefers shredded cheese to cubed or sliced cheese. Go figure. 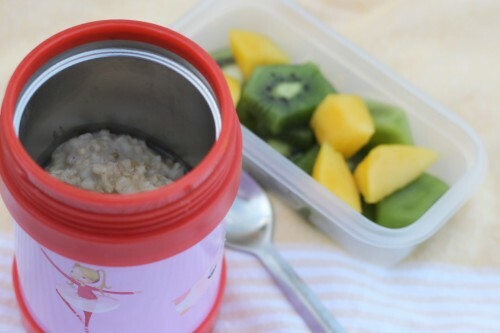 Banana Coconut Oatmeal with maple syrup (used the recipe here and it was fantastic) and kiwi and mango for a snack. 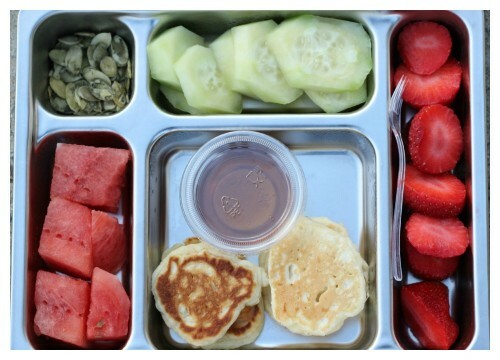 This was a big hit as you might guess 🙂 Pumpkin seeds, cucumbers, strawberries, watermelon, mini buttermilk pancakes with almond butter and pure maple syrup for dipping. Pirate’s Booty, our favorite Sprouts gummy bears, homemade pretzels (my husband made these for Superbowl), cucumbers, rainbow carrots, red pepper hummus and strawberries. 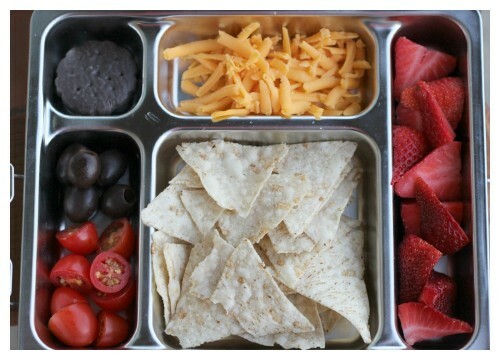 Nachos again- tomatoes, olives, shredded cheese, brown rice chips, Girl Scout cookie, strawberries. Salsa in a little cup would have been good too or black beans. Andes mint (Christmas leftover- ha! 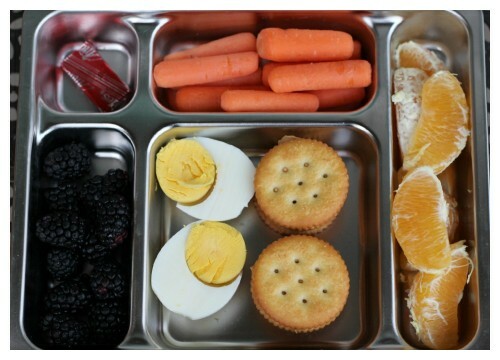 ), blackberries, oranges, carrots, hard boiled egg and Ritz crackers with Boursin cheese. Sometimes I do hummus or peanut butter in cracker sandwiches- my kids love them. 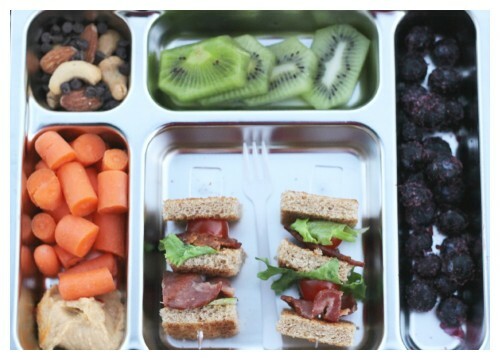 Cashews/almonds/chocolate chips, carrots, hummus, frozen blueberries, kiwi and BLT sandwich skewers. *I only include frozen berries because the kids LOVE them and eat them at snack around 9am. Otherwise they would melt in the lunchbox and create a mess. Pretzel roll with pickles, lettuce, tomato and cheese and shredded carrots, apples with cinnamon, Aussie Bite, homemade coconut marshmallow (recipe here), Greek yogurt. 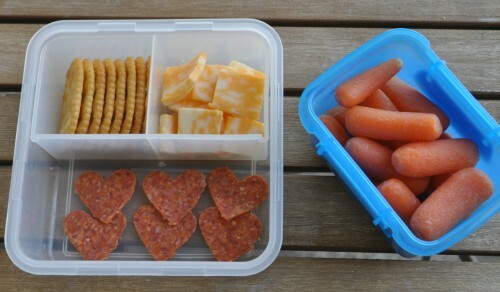 Crackers, colby cheese cubes, pepperoni (cut with mini cookie cutters), carrots. Every so often I make chicken nuggets for the girls– these I make in the morning before school and I like to cook them just slightly too long so they are very crispy. I wrap them in foil and they seem to stay fairly warm for lunch. If they are crispy they won’t get soggy but the time the kids eat them- our favorite is the Rocky Free Range Chicken Nuggets from Costco. I also included BBQ sauce, apples with cinnamon and cucumbers. Yogurt covered pretzels, cantaloupe, black olives, plum, cucumber and cream cheese sandwich and a blueberrie/spinach and pineapple smoothie with apple juice. 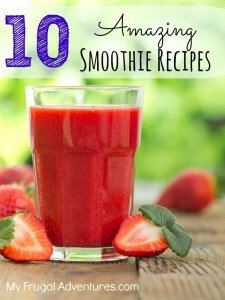 I can send the smoothie with my 7 year old to school- she won’t spill and she will close the lid tightly. My 5 year old, I bring the smoothie for an after school snack on the way home since she will spill and blueberries stain 🙂 Some people get upset that I give children mason jars but we have never had a broken mason jar and they have used them since they transitioned out of sippy cups. If you have a plastic cup or thermos that works just as well. 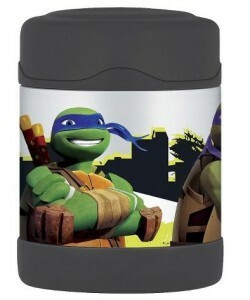 Thermos Funtainer-– these seem to be the Thermos’ that work best and the kids like them. I try to use real forks to avoid waste but sometimes I send mini cocktail forks– I get these at Walmart in the party supply section. 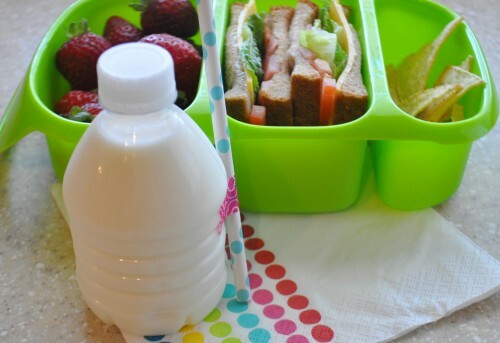 Sometimes I use these plastic containers instead of the metal lunchboxes or sometimes I use the green Goodbyn lunchbox you can see above. 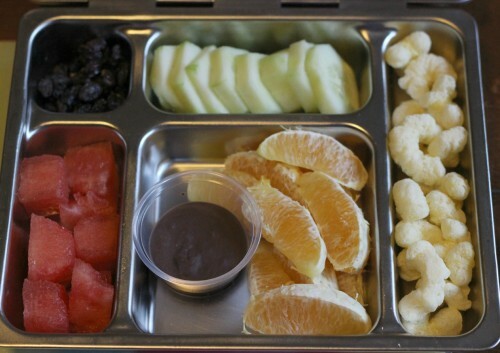 I’d love to hear what your great tips and ideas are for great school lunches! Impressive! They eat everything in those lunches? 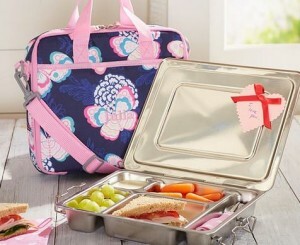 How do you like the Pottery barn lunch boxes? I’ve seen other metal ones similar to that one and it didn’t have the best reviews. What are the pros and cons? Oh for sure they don’t– I wish veggies weren’t such an issue but thank you Dodi. 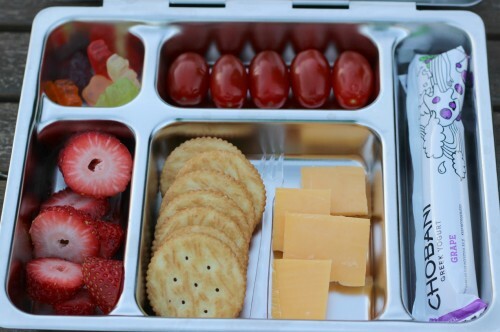 Great lunch box ideas! 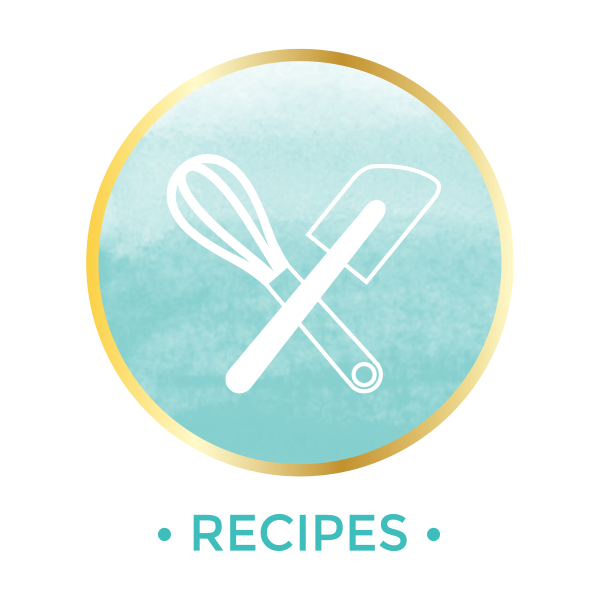 I am so glad to hear that you love my oatmeal recipe! So awesome! 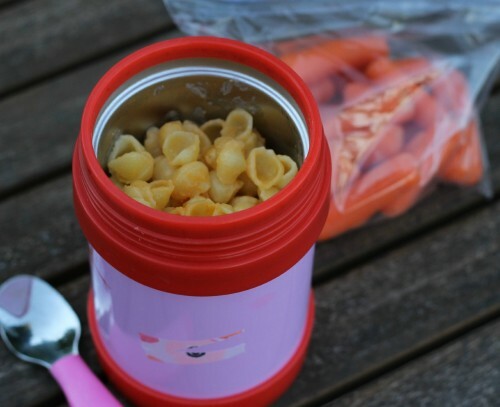 I would never have thought of putting Mac and cheese in a thermos ha ha. Such a good idea that’s why I love this site! Such a helpful post!!! I was running into a lunch rut with my 5 year old. Thank you for the inspiration!! Many thanks for this – my kindergartner has just realized how awful the school lunches are, so my grace period of not having to make lunch has ended. I knew it was just a matter of time! Pottery Barn Kids website has some of the all-in-one lunch bags on sale right now – I just got one for $31. Baked beans mixed with frozen spinach is another favorite meal; send it with grated cheese to mix and melt when it’s lunchtime. You are welcome Ariana! Glad you got some ideas. 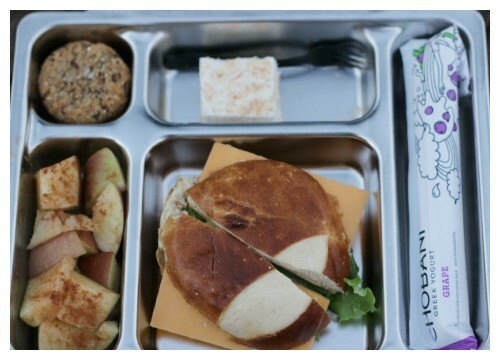 Meghan- you’ll have to come back and let us know what you think of the lunchbox 🙂 It is nice to skip a bunch of baggies on little containers. Thanks for posting this. 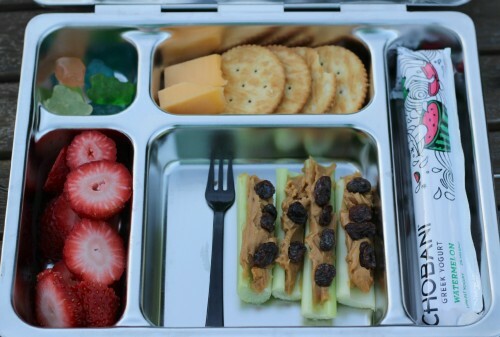 It made me think about when my mom use to pack lunch for my sister and I. We use to be excited like your kids to see what we got for the day. I did not like school lunch very well since my mom made everything from scratch, and the school food was no where as good as hers. Our friends were so jealous of our food. She would get asked by our friends sometimes for her to make their lunch too. 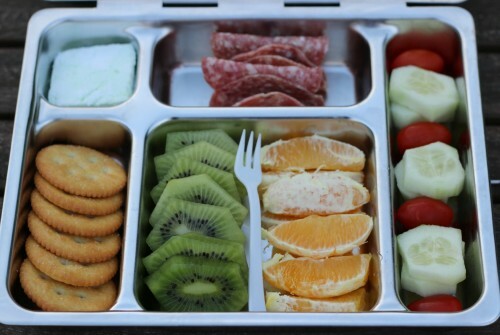 She got creative like you do to give us good healthy lunches. I remember she would put corn on the cob in our lunch box occasionally. 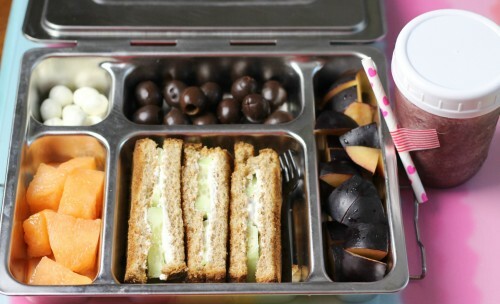 I do not have kids yet, but I have to pack a lunch a lot for school and work, and this gave me some good ideas for myself. It is so hard to come up with food ideas. Thanks for putting this together. I just took notes after reviewing it with my picky eater. I’m excited to mKe lunches again (and will make mine at the same time). Thank you!! Oh if you come up with fun ideas please come back and share 🙂 I try not to get discouraged with things. They say you are supposed to try things 10 times before you give up on a food. With my 5 year old she doesn’t love Kiwi but I still pack it all the time in winter and she eats it probably 70% of the time. 🙂 That is a win to me for sure. 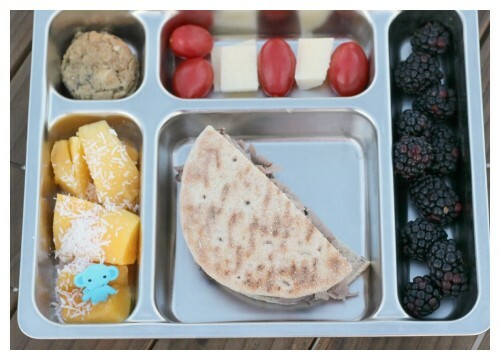 The PBK all-in-one lunchbox has been a big hit! The only minor drawback thus far is its weight – it seems heavy to my five-year old. But otherwise it has been great; thanks again for the recommendation. Really? I have a 5 year old and she doesn’t have any issues but she is almost 6 so maybe that is the difference. I am so glad you like it 🙂 Much cleaner and easier than a zillion little baggies. 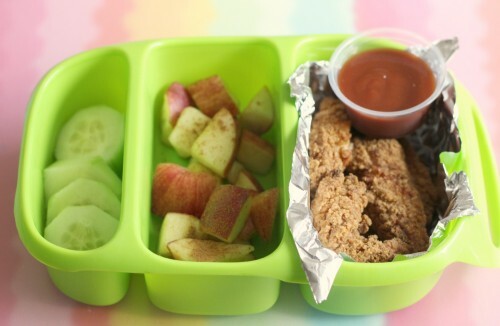 Thanks for the great ideas for picky eaters! I love the thermos funtainers and one suggestion I had read is to put boiling water in it for a few minutes before filling it to warm it up. I just pop it under the keurig and let it sit while I heat up the mac. Has worked great for keeping food warm until lunch! Oh Erin that is an awesome tip. I will for sure try that! 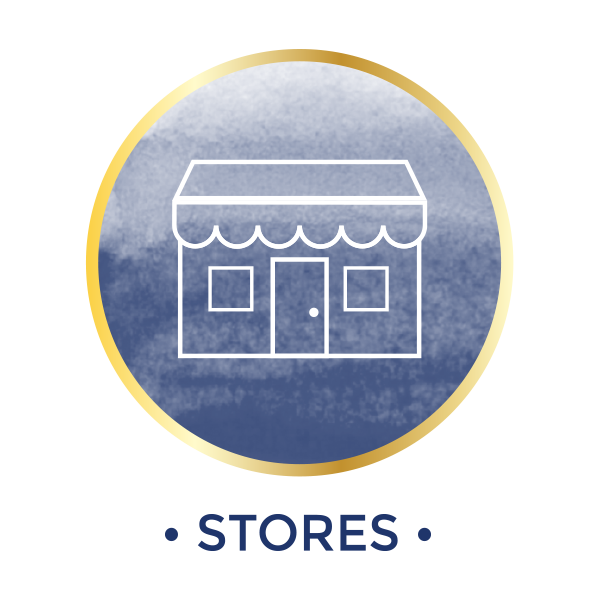 Where do you find those Chobani yogurt tubes and the vanilla agave syrup? I haven’t seen either of those anywhere, but maybe I’m oblivious! 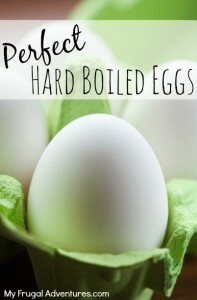 These look great!!! Can you come pack my kids lunches?? LOL!!! Where do you find the little plastic containers with lids for syrup, chocolate sauce, etc? Ha ha! Heidi those are little snack cups that I found at Walmart. They are disposable ones from Diamond. We try not to be wasteful with disposable stuff like this but I haven’t found the perfect size reusable cups that fit in lunchboxes. Who cares if these are meant for kids. I am going to use these for myself!! Haha!!! !